Catherine Richards, I Was Scared to Death; I Could Have Died of Joy, 2000. Interactive new technology installation. Stainless steel, glass, electronics, electrodes, electron guns, luminescent gases, fibre-optic lights. Dimensions variable. Installation as part of the exhibition Excitable Tissues, Ottawa Art Gallery, 2000. 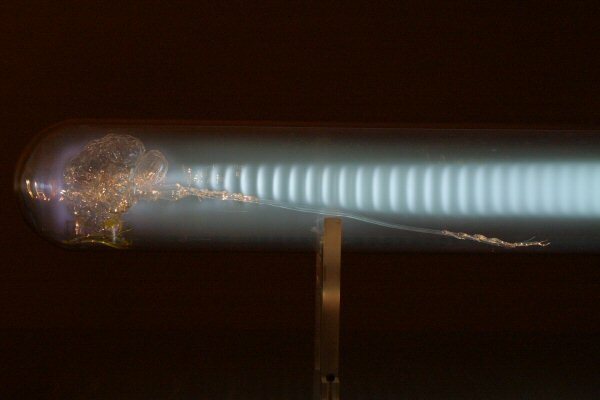 Detail view of glass brain in tube (pulsating). Detail view of glass brain and spinal cord in tube. 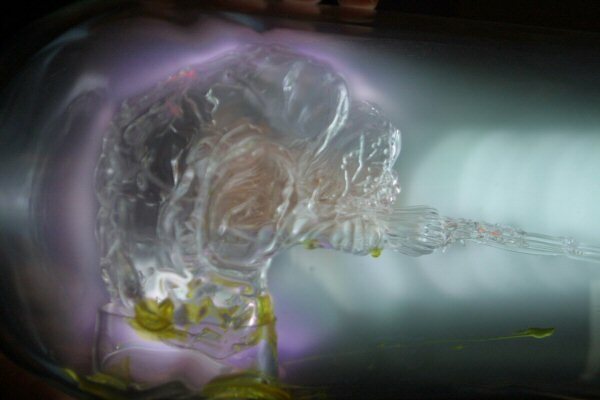 Detail view of glass brain. The artistic world of Catherine Richards is visceral, tactile, and charged with electrons. Richards's previous artworks, such as Charged Hearts (1997) and Curiosity Cabinet for the End of the Millennium (1996), have addressed the electromagnetic world, the charged environment in which all organisms live. One of Richards's latest pieces, I Was Scared to Death; I Could Have Died of Joy (2000), attempts to relate our electromagnetic field to the brain and to bring to light this constant relationship invisible to the naked eye. This piece, along with two other recent works by Richards, was showcased in a solo exhibition held at the Ottawa Art Gallery from September 14 to November 19, 2000. In this piece, visitors entered a darkened room that contained two stainless-steel tables, each holding a test tube barely illuminated by a source above. After drawing close to one of the tables, visitors would remark that inside each test tube was a glass model of a half brain and spinal cord. As they leaned in to examine the specimen, the lights would suddenly go out and the glass brain would appear to pulsate. If the visitors dared to stroke the test tube, they would notice glowing plasma ascending to meet their hands in response to their electromagnetic charge. These visually enchanting objects exemplify Richards's curiosity about old technology, laboratory science and beautiful 19th-century accoutrements and her desire to explore interactivity in a discreetly intimate manner.